In the weeks leading up to the Fancy Food Show, I get a flood of emails from various PR firms asking me to come and check out their clients’ booths at the show. If the product seems interesting, of course, I make an effort to stop by. Sometimes, bigger incentives are designed to entice the press to write about or attend a particular event around the show. 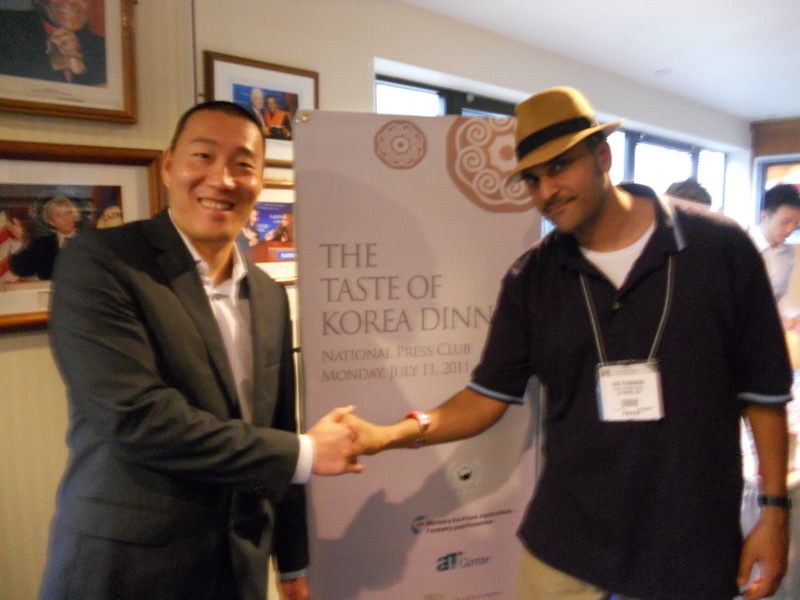 So when I received an invitation for “A Taste of Korea Dinner” at The National Press Club, I had to sign up. Though I’ve enjoyed Korean food on many occasions, I still feel like I don’t know that much about it, so I considered this a chance to learn. Even before dinner, however, as I was wandering down the Korea aisle at the show itself, I learned some new things about Korean food. 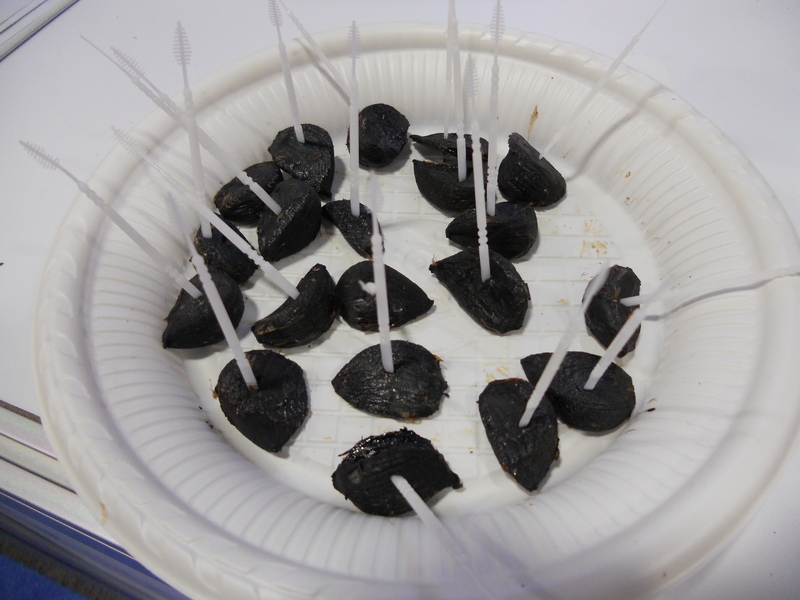 Ever tried black garlic? It’s a fermented clove that the Koreans use for its almost sweet flavor. I tried some straight first, and then I had the opportunity to try it in a dish. For right across from the black garlic booth, Chef Akira Back had set up was what was billed as Hansik Pop-Up Restaurant. 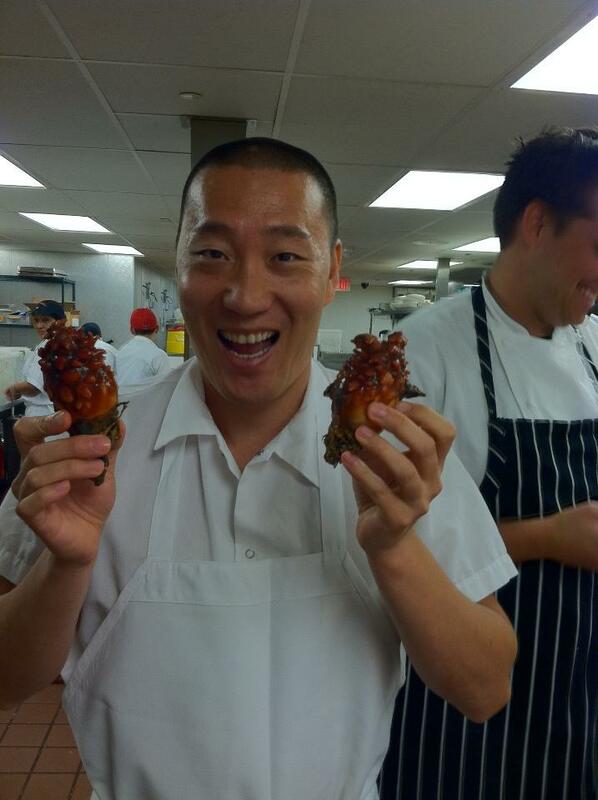 Back, a former pro snowboarder from Korea via Aspen, CO, and currently Executive Chef & Partner of the Yellowtail Japanese Restaurant and Lounge at the Bellagio Las Vegas, is also an Iron Chef alum, where he was beaten by Bobby Flay. His colleague Ryan Primo Nuqui, who had recognized me from No Reservations with Anthony Bourdain, invited me to take a seat at the quaint little pop-up restaurant, which only seated about 8. Even so, there was plenty of wait-staff, and this swank menu card. 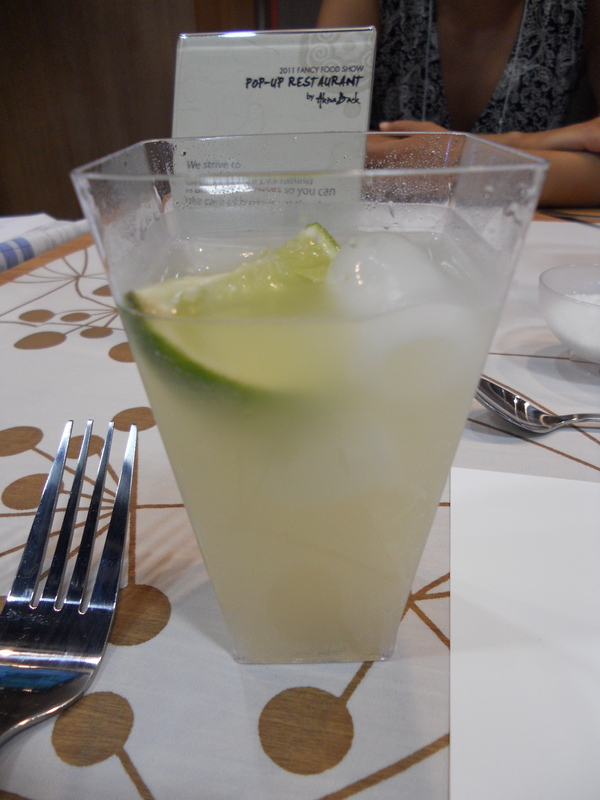 For my cocktail, I tried a “Ginger Georgie,” designed by another top chef, Jean Georges Vongerichten, and utilizing the milky alcoholic rice beverage, Makgeolli. Very refreshing! Being the adventurous gastronaut that I am, for my appetizer, I had to try something new–the sea pineapple with finger lime caviar, nasturtium leaves and vanilla essence. 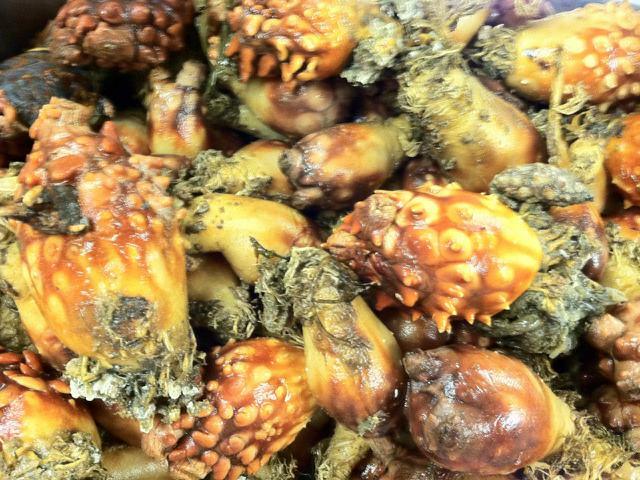 A relative of the equally bizarre looking sea cucumber, sea pineapples or sea squirts are primarily eaten in Korea, where they are known as meongge, and to a lesser extent in Japan. With a texture like raw oyster, their taste, however, is an acquired one, strong and pungent like iodine. Though I didn’t get a still photo of the actual dish, Akira’s sous chef, Eric Berlin sent me the following photos of the raw product. For my main course, or courses (because I had both), I had probably the best galbi jim I have ever eaten along with a dish called Ssam, which was basically chicken stuffed cabbage in a thick red sauce called Ssamjang. 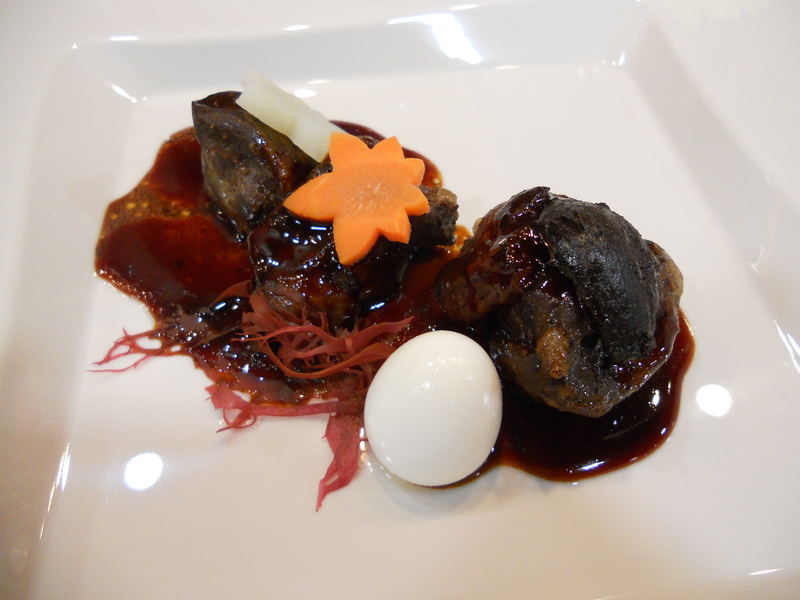 Galbi Jim, which I consider Korean comfort food, is basically braised short ribs, but Akira’s version consisted of prime beef slow-cooked in a soy-based sauce and topped with the aged black garlic I had tried solo. The beef had a sublime, melt-in-your-mouth consistency and while a tad saltier than other versions of this dish, it was offset by the sweetness of the black garlic providing a winning combination of flavors. 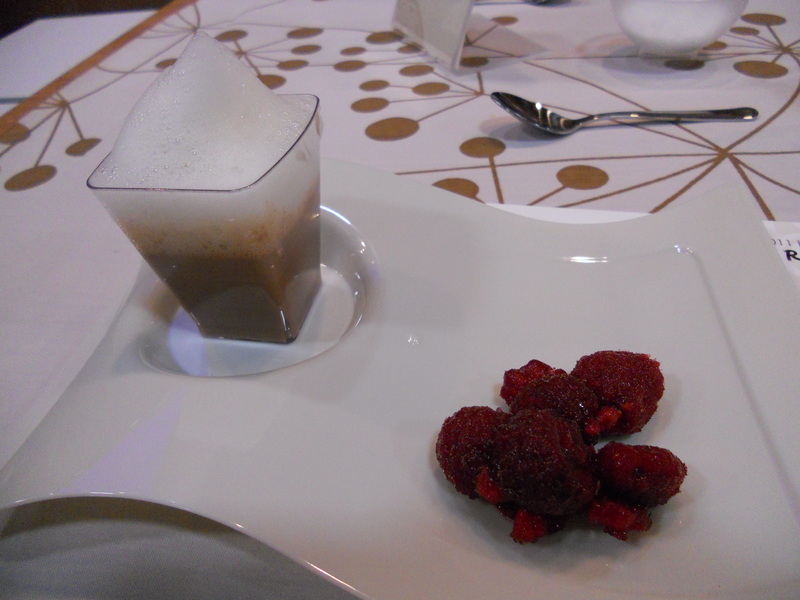 After two main courses, a cocktail, and a round of sea pineapple, I was feeling pretty full, but hung in there for a dessert of frozen raspberries and a delicious Korean iced tea topped with a kind of malted milk foam. Flavorful and light. All in all a fabulous lunch, which I practically stumbled upon. Thanks again to Chef Akira Back and his staff at the Hansik Pop-Up Restaurant, one of the many temporary tables at the Fancy Food Show. If I’m ever in Vegas, I look forward to eating at Yellowtail. 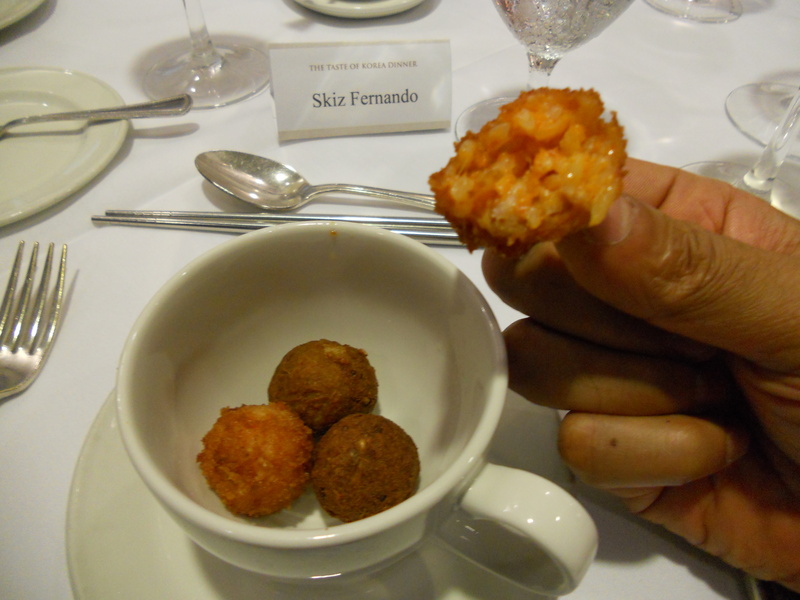 The next evening, following another full day of grazing at Fancy Food, I took a long walk through the subtropical climate of downtown DC on my way to the National Press Club on 14th St., the scene of the Taste of Korea dinner. The first person I ran into was none other than Akira Back and his crew who had come to support another notable Korean chef, who was cooking tonight, Youngsun Lee, an alum of the popular Momofuko, owner of Persimmon, and co-founder of the Kimche Taco food truck in New York. 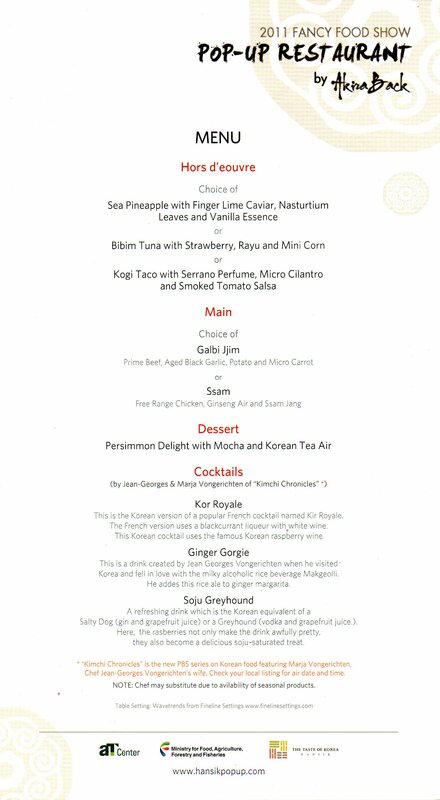 The sit-down dinner for approximately 50 people was a much more formal gathering including members of the press as well as dignitaries who had flown in from Korea especially for the event. 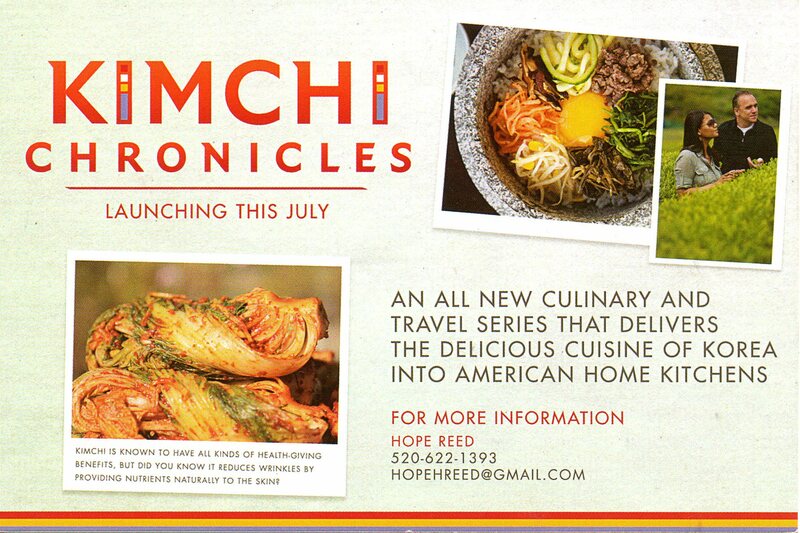 In addition to the fine Korean meal they were serving, this function also served as a premier of sorts for a new 13-episode series on PBS called Kimchi Chronicles, which will focus on Korean food. 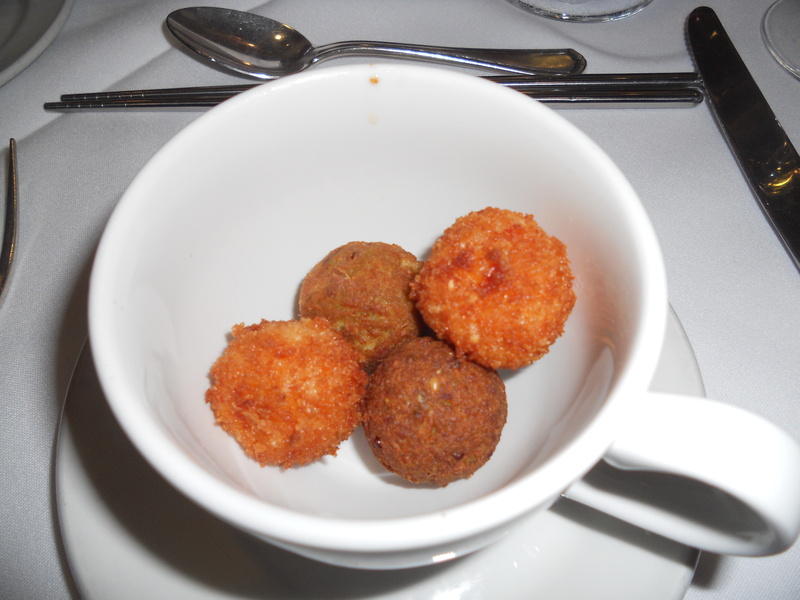 After settling into another Ginger Georgie from the bar, I took my seat and settled in as Chef Lee told us about the first course, an Italian-inspired amuse bouche (or single-serving hors d oeuvre) of a deep-fried rice ball laced with kimchi. Crunchy on the outside with a moist and spicy center, I devoured these easily in one bite, so I was happy to have four of them. 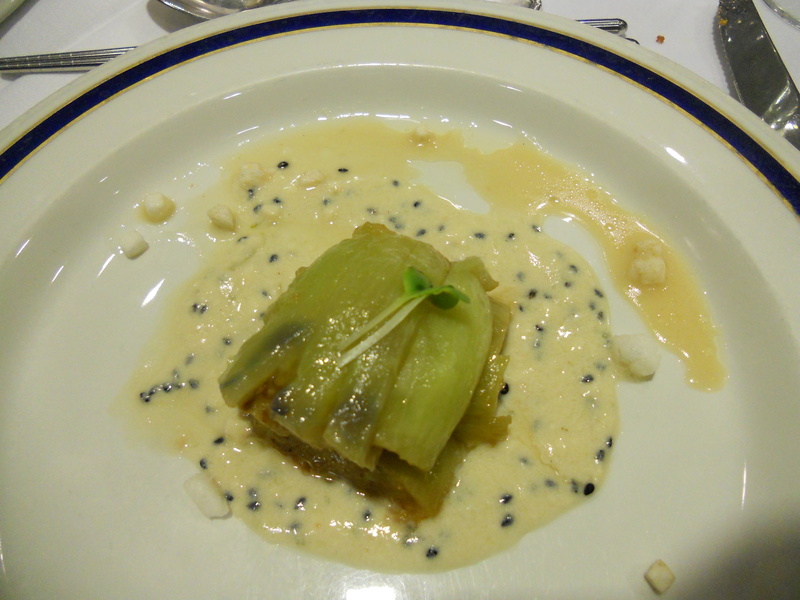 The first course of eggplant in a tofu dressing with black sesame seeds was simplicity itself. 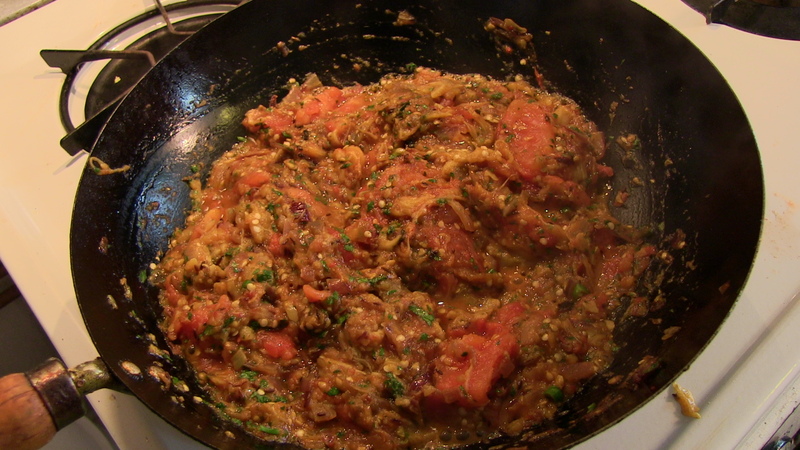 The eggplant was tender and its flavor was not at all overpowered by the mellow dressing. The next course was an assortment of Korean banchan dishes, which are like appetizers. One of the highlights of going out for Korean food, in fact, is getting lots of these little plates, so you can sample many different flavors. 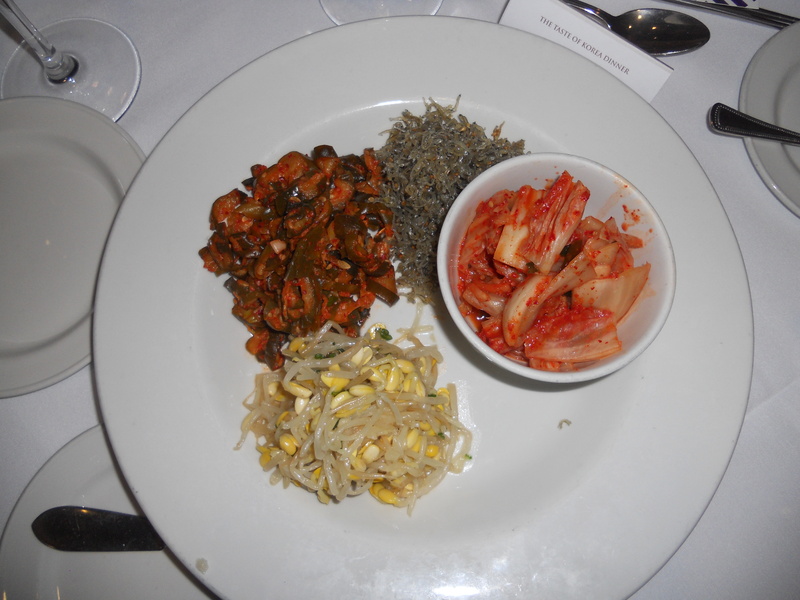 I especially loved the spicy, pickled cabbage or kimchi, in the bowl, and the miniscule anchovies just to left of it. For the main course, we had Ddeok Kalbi, the Korean alternative to the burger, with cucumber relish and some candied pistachios on the side. 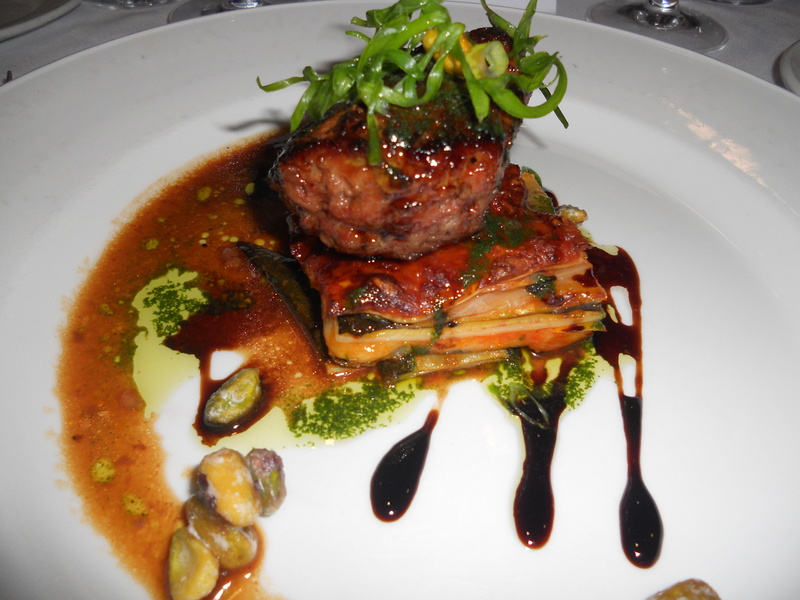 Once again, Chef Lee’s inspiration seems to have come from Italy as the patty of minced beef sat atop a lasagna of sorts, made of pasta and thinly sliced vegetables. The soy based sauce on top was amazing. Once again, I had spent a full day eating and left no room for dessert. 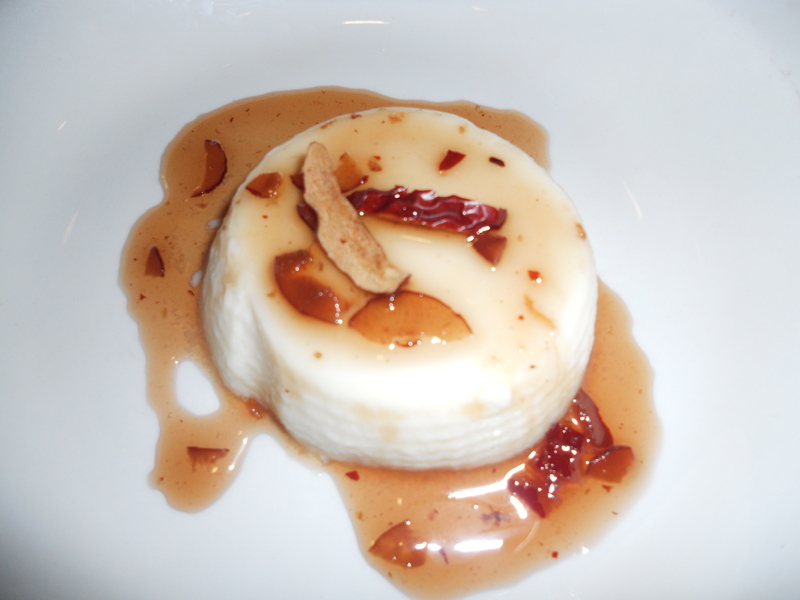 Though no big fan of tofu, I had to at least try the ginger tofu mousse, as it looked so good. I’m happy to sat that it tasted as good as it looked. Despite having eaten all this great Korean food, what excited me even more was the preview of Kimchi Chronicles, which they kept returning to between courses. Food is the best entrance into a new culture, so I will certainly be watching this new series on PBS, which follows Jean Georges Vongerichten’s half-Korean wife Marja as she rediscovers her culture through its cuisine.